Female Common and often abundant throughout Britain north to Angus, only scattered records from further north and the Western Isles and almost absent north of the Wester Ross. Unusually for an Amara this species prefers moist situationsand is typically found beneath dense vegetation near water but not, in our experience, generally riparian. It occurs in large numbers on heavy arable soils, managed grassland and open amenity sites. Found throughout the winter, adults are regulars in grass tussocks and leaf litter samples, under logs and occasionally bark from all habitats; Whippendell wood, parkland throughout Watford, town centre gardens and open spaces e.g. Shrub beds in retail parks. 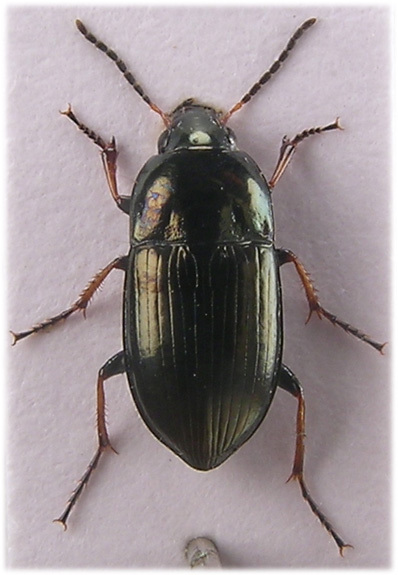 Individuals are occasionally active on warm winter days, during 2006/7 this was common behaviour, and they are among the first carabids to fly to M.V., generally during early or mid March. From early spring they are active diurnally and nocturnally. 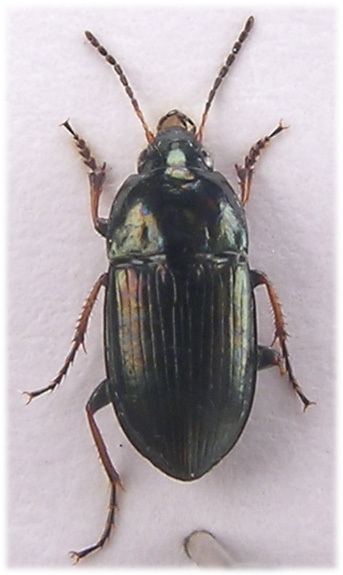 An especially large population exists along the margins of the river Colne parallel to Radlett Road, during the day they may be seen running in bright sunshine and, a walk along the kilometre or so of pathway, will reveal many specimens, usually along with a few A. aenea DG., Harpalus affinus (Scrank) and Poecilus cupreus (L.), during the late afternoon and evening they are inactive for a few hours but after dark this really is a fantastic place to see the species; the path lies from a few to maybe a hundred metres from the river and at regular intervals there are sodium lights set into the grass verges, beneath these lights on warm spring and summer nights insects are active by the thousand mostly earwigs, ants bugs and aphids but also many carabids, all the usual suspects ¹ but among them plebeja are abundant, much more so than in other parkland or open spaces, presumably due to the dampness provided by the river. They are spring breeders and fly readily ², occuring in the sweep net in most not to dry situations both by day and night. Specimens need to be brought home and examined for a certain ID, they are superficially similar to A.aenea and often found with them. Plebeja is distinctive being generally dark, black with bluish lustre but this varies, and somewhat elongate and parallel but a great deal of experience is needed to distinguish them in the field and even so be prepared for surprises, it is rash to take the identity of any Amara for granted. 6.3-7.8mm. Antennae black with segments 1-3 and base of 4 orange or yellow. 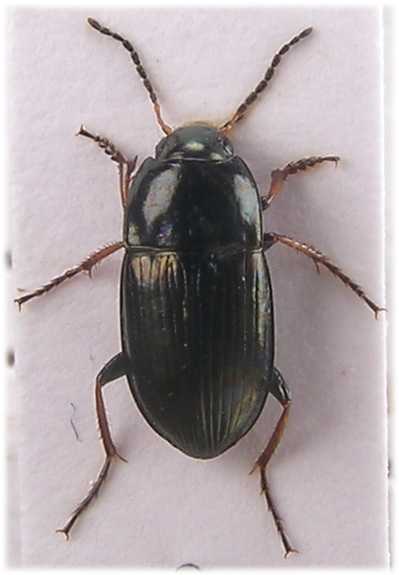 Palps black, sometimes lighter at tip. Head with angled longitudinal impressions inside eyes joined by a transverse furrow anteriorly. Two supra-orbital setae. Head and pronotum (on disc) with weak indistinct microsculpture (X40) so shiny and contrasting against the distinctly microsculptured elytra. Pronotum almost parallel sided in basal half, strongly bordered laterally and basally, front angles strongly protruding and hind margin sinuate. Two basal fovea, the inner often with a strong longitudinally impressed streak as A.aenea, setae at hind angles close to side margin. Microsculpture mucher stronger along base og pronotum (X40). All elytral striae well impressed to apex. Scutellar stria with basal pore puncture, sometimes with an extra pore along its length and sometimes interrupted. Seventh stria usually with 2 preapical punctures. Legs dark but for basal two thirds of tibiae orange. Terminal pro tibial spur trifid ³, this must not be confused with cases where there are other, smaller spurs at the apex near the terminal spur, in plebeja there is a single spur, broadened at base and trifid from basal third, manipulating the specimen will soon show this feature to good effect. Male with basal protarsal segments dilated. ¹ e.g. 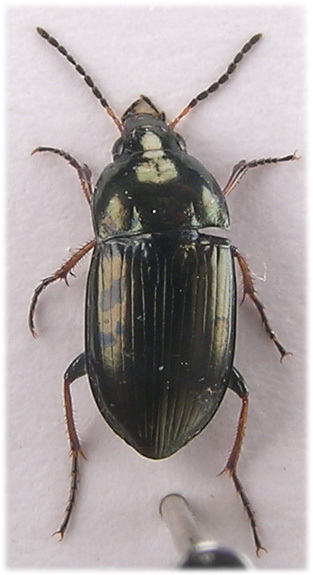 Pterostichus madidus, Poecilus cupreus, Calathus fuscipes, C. melanocephalus, Harpalus affinis, Ophonus rufipes, O.rufibarbis, Amara aenea, Curtonotus aulica etc. ² Huizen, T.H.P. van. 1977. The significance of flight activity in the life cycle of A.plebeja. 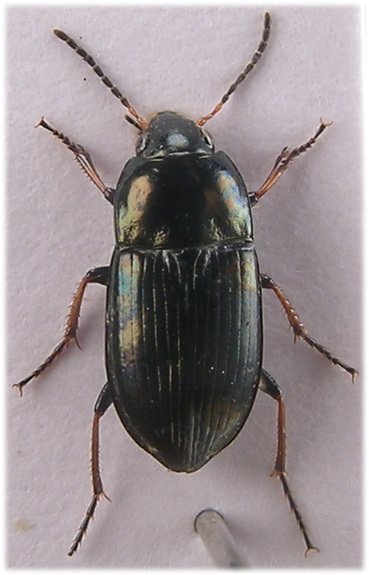 (Col. Carabidae) Oeiologia (Berlin) 29, 27-41. ³ The very rare Amara strenua Zimm. is the only other British species with the combination of trifid spur and pore at base of scutellar striae but it is always large ≥8mm.